In this article we’ll give you a free employee schedule template to help make your life easier. Plus, we’ll show you how doing employee scheduling right can increase your team’s productivity and effectiveness, reduce absenteeism, and save you money. Literally tens of billions of dollars are lost each year, in large part due to poor employee scheduling. We’ll show you how to avoid the mistakes everyone else makes. Further down, we also have a handy infographic breaking down the costs involved in employee scheduling. If you’re looking to make employee scheduling a whole lot easier, we recommend using a software such as When I Work, which allows you to schedule employees and track time on the go with a handy mobile app. Or check out our article on best employee scheduling software. Below are two free employee schedule templates that you’re welcome to use. If you have a relatively small staff with straightforward shifts, these templates should satisfy all of your scheduling needs. Employee Schedule Template 1 has two pages. Each page covers a one week period. The first page should be used as a final employee schedule once your schedule is set and no foreseeable changes will be made. The second page is a draft schedule and has a place for employees to request changes to the schedule. You can determine how far in advance a schedule will be finalized. The second employee template is a little more stripped down. It does not offer a place for employees to request changes to the schedule. This doesn’t mean that you don’t want to have a system in place to accommodate employee’s scheduling needs, but perhaps you don’t want to encourage constant scheduling input from your employees. These employee schedule templates are very flexible. You can duplicate them as needed, so if you like to plan schedules 2 months out, no problem. 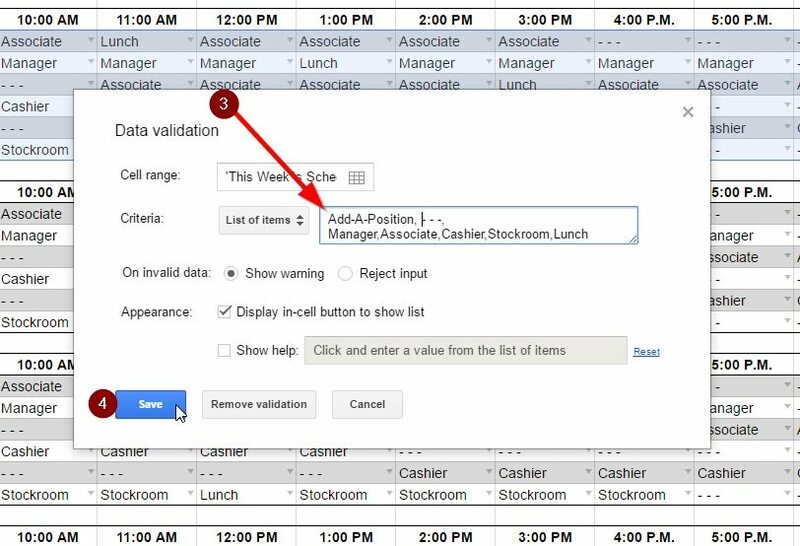 Also, you can add or subtract columns or rows to add shifts/hours or employees/positions as is appropriate for your workforce. You can also easily change the color of the text or background to add additional meaning. 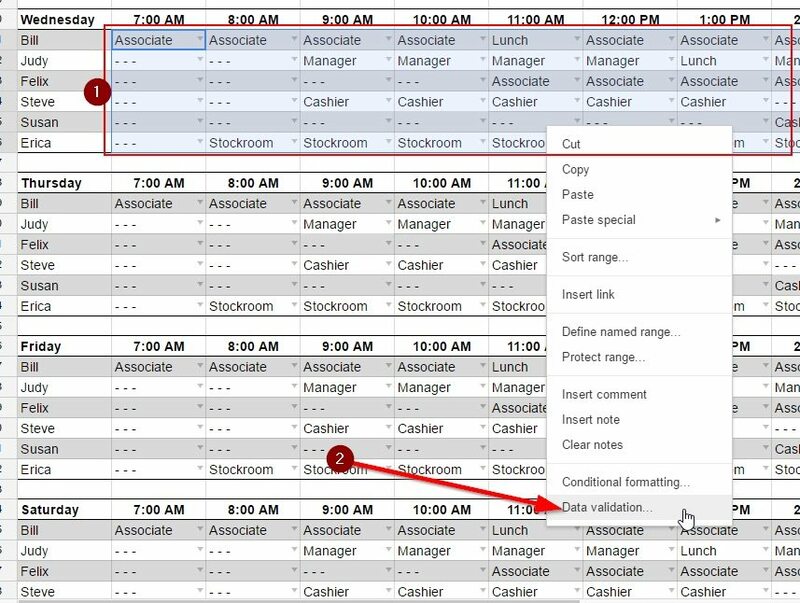 For example, highlighting an employee’s projected overtime hours in red might help you see where to make scheduling changes. Similarly, using yellow lettering for part-time employees can help you from over scheduling them. The most obvious benefit of sharing these employee schedules with your staff as a Google Sheet is that everyone will have access to the schedule anytime, anywhere. By sharing these employee schedules with your staff, you can make the schedules editable. To share your schedule, just click share in the upper right corner, add the people that have permission to edit, leave a note informing people when the edit period will end, and click send. If you would like your employees to be able to contribute their input and preferences to a schedule when it is three weeks out, let them. They can do this on their own time, and your employee schedule template won’t be covered in post-its and marked with arrows.As the week in question nears, you can change the settings so that only managers can edit the schedule. By sharing and controlling access to our employee schedule templates, your employees will be happier with their schedule and you will maintain control over the final schedule. You’ll have done this without the clutter and confusion of printouts and post-its. And everyone will have had access to this at anytime and from any desktop, tablet, or smartphone. If you want to build your own employee schedule template, feel free to use our’s as blueprints or jumping off points. Here are some tips to make sure your employee schedule templates include everything they’ll need. If you include the above information, you’ll have an employee schedule template that can accommodate the needs of most small businesses that have one location and a small number of staff. But doing the minimum required to assemble a schedule can create problems. Making some small adjustments can take your scheduling to the next level. Take it from John Waldmann, Founder and CEO of Homebase, a cloud based employee scheduling company. How do employees request shift changes? Will you post open/free shifts and wait for employees to fill them? If scheduling changes are allowed, do they require managerial approval? If scheduling changes are allowed, when does the schedule become final? If an employee is sick, who do they call and how is their shift filled? How does the schedule work to limit overtime hours worked? How does the schedule ensure part-timers don’t work too much? Who’s in charge of making sure everyone see’s the schedule? Is there a daily schedule update and confirmation? As you can see, there’s a lot to consider and coordinate when it comes to good employee scheduling. As your operations expand and the number of employees you must manage grows, your employee scheduling will need to get more sophisticated. Working from the same employee schedule template probably just won’t cut it. That’s where modern employee scheduling software comes in. 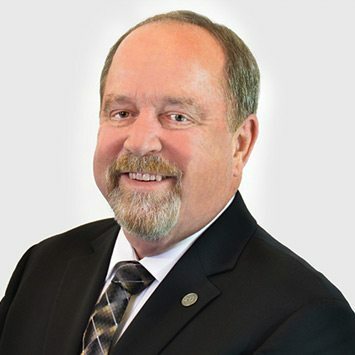 “Today’s scheduling tools provide for the employee and management to set an employee’s availability according to other life considerations, like class schedules, additional employment obligations, and family needs,” said Larry Dickinson, the time and labor management Product Specialist at PrimePay, maker of the ReadySetWork employee scheduling tool. Employee portals where they can set availability, ask for time-off, request a shift change, etc. It isn’t just carelessness or lack of technology that leads to stress on employees and management, which eventually leads to higher employee turnover. Sometimes deliberate scheduling practices result in the same thing. 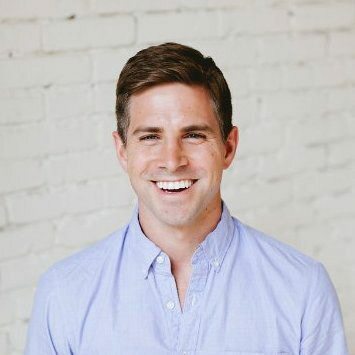 Two scheduling techniques that are hard on both managers and employees alike are “on-call” scheduling and “just-in-time” scheduling. They’re most common in the retail and hospitality industries. They’re also completely unnecessary if you’re using a modern POS system, like Lightspeed POS, and an employee scheduling tool, such as When I Work. Those two tools integrate seamlessly and, together, give you access to historical sales data to predict shift needs down to the hour and a scheduling tool that pulls up the right roster with the click of a button. That let’s you leave the guessing and stressing to your competitors. Let’s take a closer look at these scheduling practices. On-call scheduling is the practice of assigning employees to possible or potential shifts. It’s a form of scheduling meant to address the difficulty of knowing how busy you’ll be during any given shift. If it turns out that things are busy, then you call the on-call employee and they must come in. If it is not busy, then you call and tell the employee not to come in. The catch is the employee must set aside time in their schedule so they are available regardless of whether they end up working (and getting paid) or not. It’s easy to understand why an employee would not appreciate this form of scheduling. Just-in-time scheduling refers to schedules that are posted only a day or two in advance. Again, this form of scheduling is meant to address the difficulty employer’s face at knowing exactly how much staff they’ll need. By posting only a day or two in advance, the thought goes, you will better be able to factor in things that might impact how busy you are, like the weather. But posting a schedule with such short notice leaves employees with very little time to plan the rest of their life around work. With so little time to plan, you’ll see more last minute shift-swaps and higher levels of absenteeism. Luckily, there’s a better way to help you schedule the appropriate number of employees for your business. If you’re using a modern POS system you will have easy, instant access to historical sales records. You can filter these records by week, day, and even shift. With this information available to you, you’ll be able to accurately predict what staffing needs you’ll have far in advance. Not only will you know how many staff members you’ll need, you’ll also know who to schedule. The reporting from the POS will show you how many sales or returns your doing during a given shift. With that information you can schedule your top salespeople for big sales shifts and reserve the b-squad for times that are slower or have larger amounts of returns. New POS systems make identifying these kinds of insights easy and instantaneous. The industry pros say that a badly managed employee schedule will drive up stressors which will inevitably lead to higher rates of employee turnover. That begs the questions: Does employee turnover cost small businesses money? If it does, is there anything they can do about it? Badly managed employee scheduling costs your business big time. Replacing your average retail, leisure, and hospitality worker costs $3,485. Not only that, but their turnover rate can be nearly double that of all other industries. But with better employee scheduling practices, you could decrease your turnover by 22.9% and even increase employee productivity. That adds up to $16.3 billion dollars per year in potential savings for retailers and hospitality businesses alone! Want to dig into those numbers? Based on case studies, the Center for American Progress found that the average cost of replacing an employee who earns less than $30,000 per year is 16% of their annual wages. Replacing those making $50,000 or less costs 20% of their annual wages. Who is it that’s making under $30,000 per year? 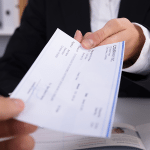 Well, according to the Social Security Administration (SSA), in 2014 over 51% of wage earners were under that $30,000 mark. This would include the vast majority of retail, leisure, and hospitality employees. In fact, according to the Bureau of Labor Statistics (BLS), the median annual salary for retail workers in the U.S. in 2015 was $21,780. That means the cost of replacing your average retail worker is $3,485. And workers in the retail, leisure, and hospitality industries have much higher turnover rates than average. 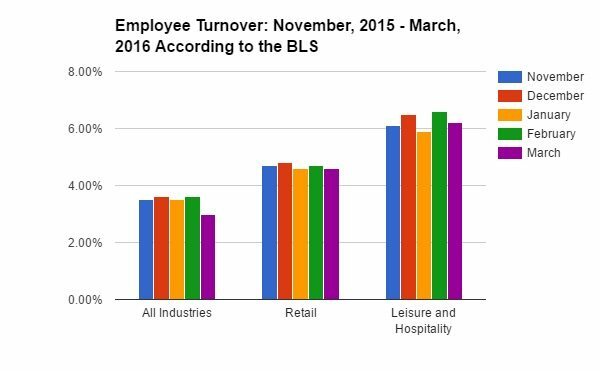 Based on this BLS data, that works out to an average turnover of 1.7 million employees per month in the retail, leisure, and hospitality industry. Doing the math, this means the U.S. is spending approximately $5.9 billion per month – or $71 billion per year – replacing workers in those industries alone! So, how can small businesses save their share of that money? According to a report issued by the Center for Law and Social Policy (CLASP), when managers more closely considered employees’ scheduling needs, stores had 22.9 percent lower turnover. That’s $16.3 billion dollars per year that retailers and hospitality employers could save with better scheduling practices. And that’s not all. 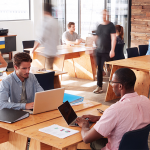 That same CLASP report site surveys which businesses which were more flexible with employee scheduling 79%t of managers reported increased team productivity and effectiveness 74% reported reduced absenteeism. Saving your small business’s cut of the tens of billions of dollars wasted on replacing hourly workers is affordable and easy. An employee scheduling software such as When I Work makes scheduling faster for everyone involved, and can help save your business a lot of money in the long run. Employee scheduling is a headache, but also an essential part of running a small business. 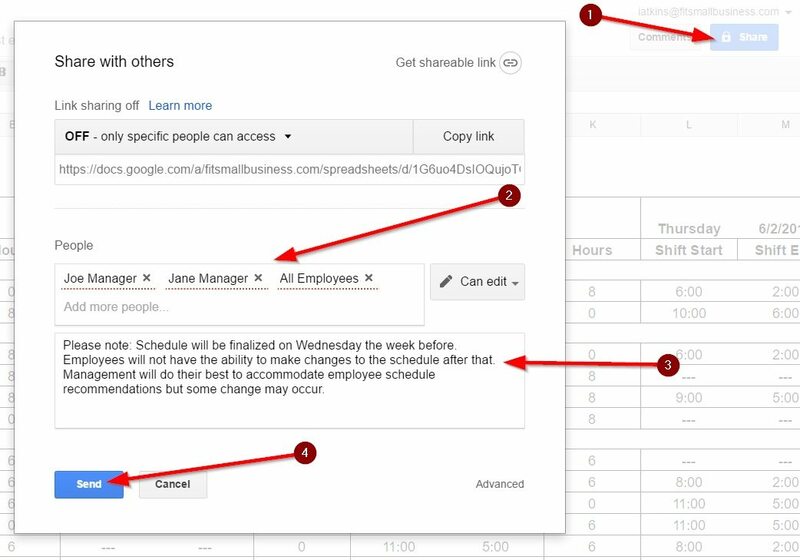 Using our employee schedule templates and sharing them with your staff via Google Sheets will help reduce those scheduling headaches significantly. Not only that, but it will likely help you reduce turnover, absenteeism, and increase team productivity. All of that means more money in your bank account at the end of the day. To really make your life easier and take your employee scheduling to the next level, enlist the help of software such as When I Work, which allows you to schedule employees and track time on the go with a handy mobile app.